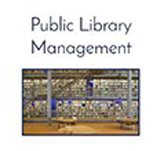 What is Public Library Management ? A library is not just a place for keeping books, magazines, journals. It is more than that holding a major wide range of reading materials which are handed over to the readers by the staff members. In general, libraries offer a wide range of duties like collecting, circulating, preserving, organizing and retrieving information. Managing a library involves development, storage, management and maintenance of a public library. The basics of a public library are introduced in this tutorial. People who are interested in knowing the Public Library basics and management and are moving to establish themselves as a librarian. Reader should have minimum idea on media, resources and management contexts. Having communication skills, analytical thinking, creativity are additional qualities.